Two students were arrested and one was injured during celebrations that broke out at the University of Rhode Island after the Patriots’ Super Bowl win Sunday night, according to URI Public Safety officials. Benjamin Schiffer, 19, a business major from New Hartford, Connecticut was arrested and charged with disorderly conduct, vandalism and malicious injury to property. Seth Mace, 19, a mechanical engineering major, of Wakefield, Rhode Island, was arrested for disorderly conduct. – Related: Who Is Liable For An Injury On Public Property? 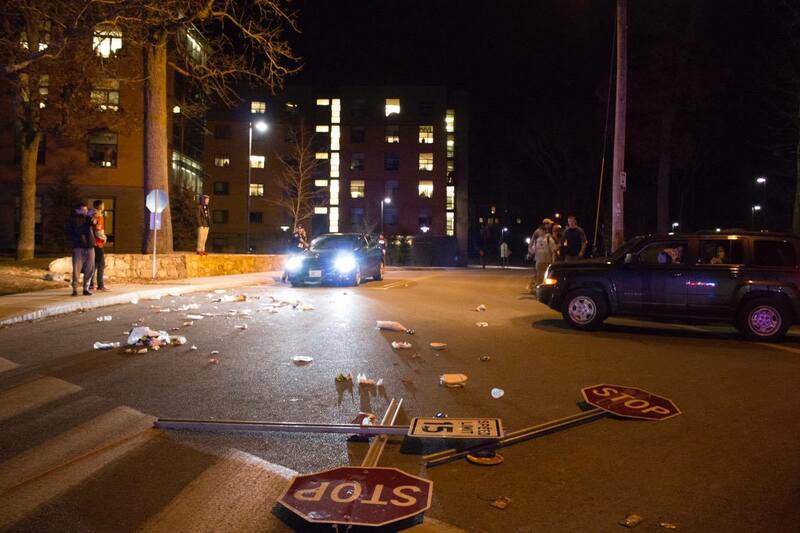 Mace reportedly threw a trash barrel into the road and was yelling obscenities to incite other students, Baker said. Mace fled from officers and was tackled and arrested behind Eddy Hall. Baker said one student did suffer a head laceration, but he said he was unsure of what caused the injury. An estimated 800 to 1,000 students started to gather around campus as soon as the Super Bowl was over, at around 11:30 p.m., Baker said. The Department called in local police officers from South Kingstown, as well as some Rhode Island State Police to help handle the crowds. Students, dressed in Patriots gear, exhibited riotous behavior throughout the Kingston campus. They dismantled road signs, knocked over trash cans and set a dumpster on fire near Fayerweather Residence Hall. Some students went swimming in the pond next to the Anna Fascitelli Wellness Center, students said. Others reported seeing students climbing the goalposts on the football field. “It started down by the gym, people knocked over a dumpster, lit one on fire,” Jake Clark, a sophomore, said at 11:50 p.m., shortly after the crowds formed. Students threw toilet paper in the trees, and lit the paper on fire, he added. Later, a student brought a speaker to the quad and was playing music, while other students chanted “Brady” and “U.S.A.” The group migrated down to toward Barlow Circle, where students were seen tearing trees out of the ground and attempting to knock down a lamp post on the hill next to Butterfield Dining Hall. Officers attempted to break up crowds using nonviolent techniques. It was rumored that officers used pepper spray, but Baker dispelled these rumors. The Rhode Island State Police were called in for assistance around 11:30 p.m. when the crowd began to get out of control, according to Police Maj. Michael Jagoda. Fire and EMS services were also needed. The University takes preventative measures any time a large event takes place in order to prepare for student reactions, Baker said. The damages cost was relatively low, compared to the similar Super Bowl crowds in 2015, added Baker. The only significant damage done was a cracked window on the front of Butterfield Dining Hall, estimated to cost $1,500, he said. 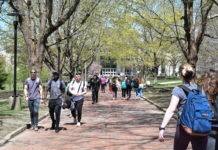 “Ultimately, we all end up paying for it somehow, through tuition or taxes or other fees” Jagoda said. Even those who didn’t celebrate the win at all. Jagoda agreed with Baker that the celebration quickly got out of hand. For students who did act destructively, Jagoda feels that their actions went against community values. While many students celebrated without causing damage, the ones who “took it a little overboard” did cause concern for the public’s safety. 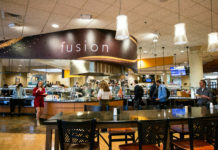 Although only two students were arrested on Sunday night, Jagoda said that there may be further sanctions on members or the campus community, either internally or externally. Some students took to social media to express their opinions on the riots. “I don’t support property destruction under any circumstance but somehow you [were] all more energized to come out in droves because of a football game than the night where an fascist was elected. Prioritize your energy #uri,” freshman Mark Gall wrote in the URI Class of 2020 Facebook page.